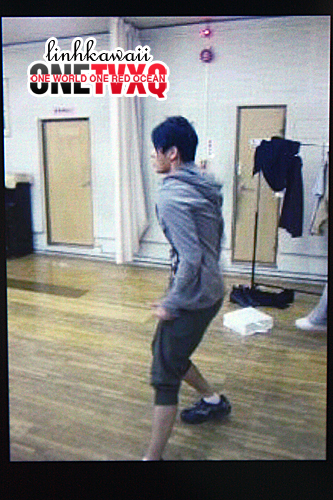 Max Matsuura has posted 3 photos of Junsu on Twitter just now. He said something about Junsu arriving and eating the hitsumabushi in a matter of 3 minutes. But of course, I don’t trust online translators too much so I’d rather wait for other people to translate it. For now, I’ll post Junsu’s pictures. Finished eating in 3 minutes. 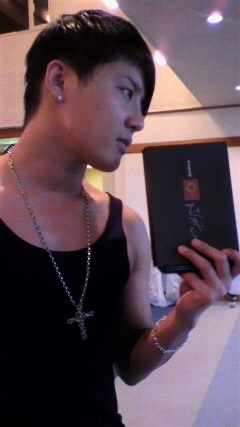 It arrived on JunSu’s hand. Some news on Junsu’s new song which will be used as an OST for a BeeTV drama. 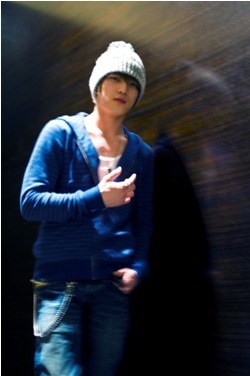 “Kanashimino Yukue” of XIAH junsu will be the theme song! The theme song, which will add grace to the love story, will be Junsu’s (from Tohoshinki, which activities are now suspended) solo ballad song, “Kanashimino Yukue”! The soft vocal (we attend to the song before we know) and the lyrics which were written especially for this drama, will enliven the mood of the drama, blending in harmony together with the warm and single-hearted love, which is described in the drama. “Kanashimino Yukue” is scheduled to be in XIAH junsu’s new single, to be released on May 26. First time to appear on BeeTV! A must cry emotional love story “5 nengono love letter”. Awww, sweet! Hahaha. I bet Junsu will be even more energized once he finds out that Max Matsuura has bought him his favorite hitsumabushi! LOL. Q: I want to hear you say “Hitsumabushi de himatsubushi” (JunSu’s oyaji gag that means “Killing time by eating hitsumabushi”). I’m waiting. “I had early morning today so I’ll come back,” he said and came back. Q: Why didn’t you and Vice President Chiba know about the discontinuation of Tohomobile? A: Because we are a large company. I was very disappointed. I won’t discontinue Tohomobile. If it gets discontinued, as it is under my responsibility, I will quit too, so please don’t worried! I haven’t watched the whole episode yet so I’ll save my comments for later once I’m done watching it. Ok, I’m back to give my comments on this episode! I seriously think the drama is getting better with each episode. This one is much better than the first because we can slowly see the story of each character. Add to that, JaeJoong has more exposure here and am I the only one who thinks he’s much cuter in this episode? LOL. My favorite scenes would have to be the one where they met up again and had a good time eating and playing (this is my most favorite scene) and the scene where he was having a meal with his sister. He’s definitely improving in every episode and his facial expressions are getting more and more believable. Anyway, I’m looking forward to the next episodes. This drama is just getting better! An update on JaeJoong’s filming from Seki Yoshihiro. A message by that recording director! Please at least check the CDs! I’m going to announce the answer! My job is like a carrier pigeon! By the way, just a little talk of the past. There’s a director who came to me being all excited and said, “The best song in my whole life being a director was born!”. Well then question for you! What song is it?? Of course it’s their song! There was a notice from the Tohomobile staff that the service will be discontinued due to the current situation of the boys. For “Tohoshinki Mobile”, it has been hard to provide new content due to Tohoshinki’s hiatus, and it has been decided that the service will end on the 30th of June 2010. For supporting us till now, we deeply thank you and ask for your understanding. Till the 30th of June 2010, the same service will be provided, but registrations will only be up till the 31st of May 2010. Again, in the SECRET ZONE, the “TOP page Customise” service will finish on the 31st of May. From the 1st of June, the image will automatically be the default picture. Also, the contents of the SECRET ZONE will be released to all members joined till the 31st of May during the 1st to 30th of June. Downloads of ringtones and movies from the LIMITED ZONE will also end on the 31st of May. For users with the limited RBT setting, please be aware that it will be disabled from the 1st of July. Thank you and please understand this. But due to the demands of the fans, the staff together with the Avex management and DBSK’s representative Seki Yoshihiro, it has been decided that Tohomible will continue and it’s going to be for free. Sorry for making you wait. Since we have received a lot of strong demands and requests from everyone. We decided that we would continue Tohomobile for free. For more details please check Tohomobile site. Regarding Tohomobile this time, we made the decision [of discontinuing Tohomobile] because we thought that we wouldn’t be able to give you more reports considering Tohoshinki’s current situation. However, since we have received many requests and demands from everyone, we are having an urgent meeting now. I’m very sorry but please be patient and wait for a short while. I think Tohoshinki’s fans will more or less be bewildered. This doesn’t mean that SM Entertainment is bad. They (Tohoshinki) did talk to the Korean side, and it was a positive talk. Please give us a little bit more time. We will get it under control. I heard about the discontinuation of Tohomobile from you guys (staff) just now. Did you make a mistake, is this true? If you want to do it, at least you have to tell President and me because we’re also in charge of it! No matter what kind of reason you have, it’s unbelievable that you guys decided on such important matter without our permission. President and I are already friends of Tohoshinki’s fans. Even if it couldn’t be helped, to discontinue it is something unbelievable. T/N: In short, there was a miscommunication between Toho staff and the President/Vice President, and the staff decided to stop Tohomobile on their own without asking for permission, thus made Chiba-san angry. After this, they have decided to change Tohomobile from a charged service to a free service. 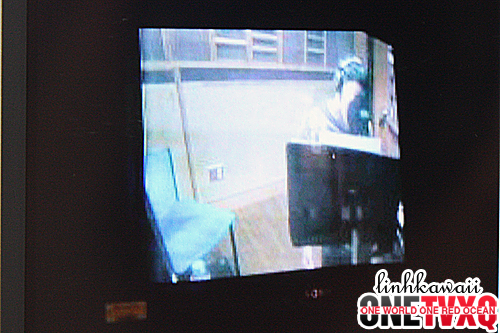 Another update of Junsu’s recording from Tohomobile. In the middle of recording! 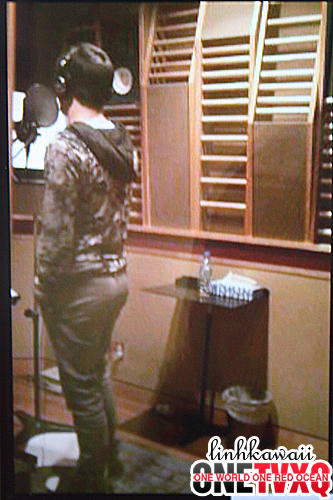 Right now, Teacher JunSu is in the middle of recording! We sneaked into the booth to take a candid shot! 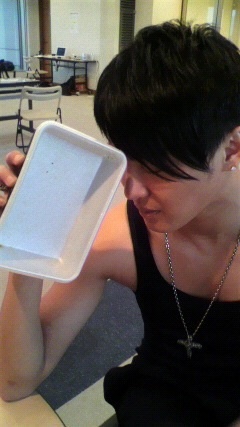 But JunSu was concentrating too hard to realize that we took a picture of him (LOL). In the middle of dance rehearsal! Due to Tohoshinki who has stopped their activities, it has become hard to keep the content of Tohomobile going, thus we will end Tohomobile service on June 30th, 2010. From our hearts, we are very grateful for all your supports up until now, and we sincerely apologize for this. Regarding the clarification on the important notice by the Tohomobile staff, go to THIS POST.